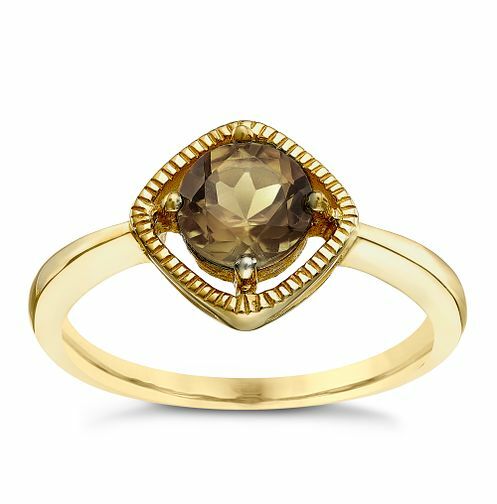 Appearing to float in a diamond shaped setting with milgrain edging, this elegant 9ct gold ring features a claw set glimmering smokey quartz centrepiece, delivering intense colour and sparkle. Sure to become a favourite in her collection. 9ct Gold Smokey Quartz Milgrain Detail Ring is rated 5.0 out of 5 by 1. Rated 5 out of 5 by Anonymous from Beautiful ring I brought this ring as a gift to myself. It’s so delicate ana beautiful that I love it. Highly recommend it.